The 1969 Mustang GT sport option package included any of the V8 engines except the 302ci V8, special handling options, racing stripes, dual exhaust, hood pin type latches, non-functional hood scoop, GT gas cap, and styled wheels with Argent Silver trim and GT emblem hubcaps. The GT option($147 base upgrade) was offered on all body styles. This was the last year of the classic GT sports options package, the GT returned in 1982. Only 6,694 GT equipped Mustangs rolled off the assembly line in 1969. Acapulco Blue 1969 Mustang GT fastback with a modified 351 cubic inch, V8 engine. This car was originally ordered with the GT sport option package which included the 351ci Winsor V8, special handling options, racing stripes, dual exhaust, hood pin type latches, and styled wheels with Argent Silver trim and GT hubcaps and gas cap. The GT option($147 base upgrade) was offered on all body styles. This car has a dealer installed hood tachometer which has also been restored. Champagne Gold 1969 Mustang GT owned by Gerrianne Narish from Lakeside Arizona. The owner had this to share, "I had been looking for a 69 Fastback since seeing one at a much younger age. My Bro was air-vac'ed to Phoenix after being hit by a drunk driver. I saw it parked on my way to the hospital but did not waste any time and drove past exceeding every speed limit. I arrived at the hospital and a team of Doctors met me. They told me that my Bro did not make it - there was nothing that could be done. The ride home went much slower. I was going to drive past the Mustang, but I knew he would have wanted me to stop. I found out that a serious collector had also passed away - his son was selling all the cars to move to Paris and start a-new. We had something in common, and he wanted the cars to have meaning to their new owners. So at 16 I bought my car in Payson, Arizona . After trying to find a few replacement parts and failing, I was confused. While getting gas one night a magnificent truck and hauler pulled in. The driver had the most beautiful 1969 Camaro inside the hauler. He got out and begin to speak to me. Asking if I knew what I had, and what I was driving. With disgust he said 'Please tell me you don't drive this car everyday, it belongs on a glass show room floor.' Coming from a person who loved Chevy's this made me curious as to what my car might really be." Gray 1969 Mustang GT fastback with a 351ci, V8 engine. 1969 Mustang GT package same with side stripe, non-functional hood scoop (unless ordered with the Q-code, Cobra Jet, Ram Air engine), and GT steel styled wheels. These are Magnum 500 wheels. Champagne Gold 1969 Mustang GT convertible with a 351ci 4-barrel engine and 4 speed manual transmission. This one wears a set of chrome Magnum 500 wheels. Another neat special order gold for the 1969 Mustang is Spanish Gold. 1969 Mustang GT painted in Kona Blue. It's owned by Terry Nenno from Wilmington, North Carolina. It has its original 351ci V8 engine and an automatic transmission. Terry tells us, "Its all matching numbers. I found it on the net. It has been kept under cover from 2007. There was no rust what so ever any place on the car. I restored it for my son." 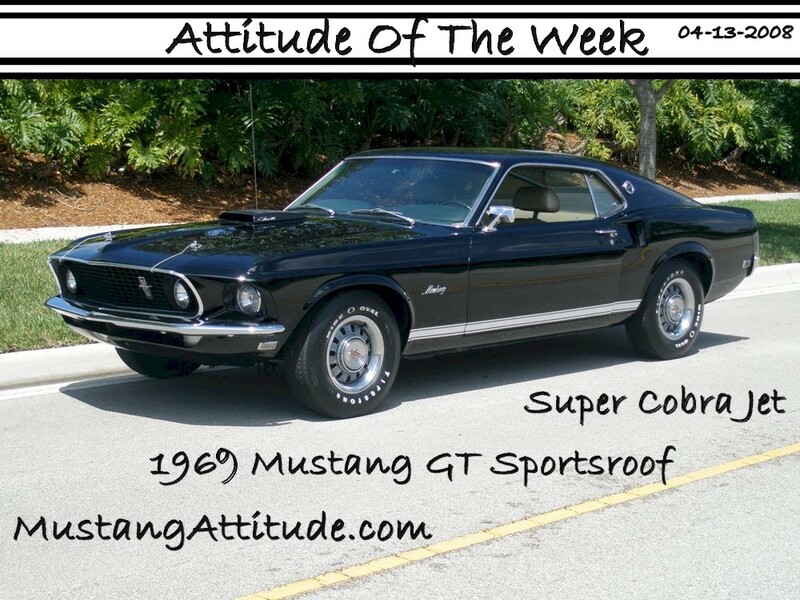 This Raven Black 1969 Mustang GT sportsroof/fastback with a 360hp (at 5400rpm), 428 cubic inch, 4 barrel, super cobra jet, ram air, V8 was our Attitude Of The Week for 04-13-2008. This car has the optional GT equipment group which consists of rocker panel GT stripes, GT gas cap, GT hubcaps on argent styled steel wheels, hood pins, simulated or functional hood scoop, and chrome quad outlets depending on the engine ordered. With the 428 Super Cobra Jet upgrade came the Drag Pack which included an external oil cooler mounted in front of the radiator. This photo is also available as a 1000 by 750 pixel wallpaper. This is a Wimbledon White 1969 T-5 fastback. The "Mustang" could not be registered to be driven in Germany back in 1969, but the "T-5" could. So Ford exported T-5s to Germany instead of Mustangs. This one has the GT package too! Other options include 351 Windsor H code V8 engine, automatic transmission, factory tach, flipfold rear seat, power disc brakes, clock, full tinted glass, and 14-inch GT style wheels. Lime Gold 1969 Mustang GT hardtop with a dark ivy colored interior. This car has white rocker stripes with GT lettered on them. It has hood pin locks and even GT wheels.